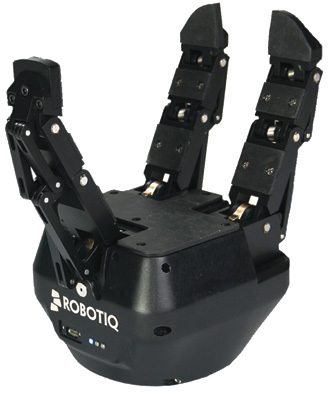 The Robotiq S-Model industrial-grade adaptive gripper introduced by Motoman Robotics, Dayton, OH, proves ideal for a wide range of applications including machine tending, fixture load/unload, high-mix part handling and kitting. The gripper features three articulated fingers that can adapt automatically to a variety of part size and shape. Its sensorless grip detection distributes pressure to as many as 10 contact points, minimizing the potential for part slippage. Use the gripper for applications requiring a single robot to handle a high mix of part types, eliminating the need for a tool changer and multiple tools. Compared to custom tooling, it reportedly reduces setup costs and cycle time due to its short stroke and elimination of tool-change delays. It features four operation modes—basic, wide, scissor and pinch.